Tuesday: Lunch at 11 AM followed by 50/50 and Bingo at noon. Wednesday: Board of Directors Meeting 5:30pm. 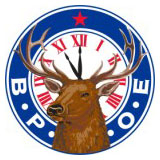 Lodge Meeting 7pm. Friday: Sloppy Joes with Pasta Salad, Chips and Dessert. Bingo after Dinner. Jerry Davis is at Longmont United Hospital for Congestive Heart Failure.